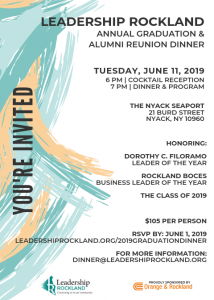 Leadership Rockland offers existing and emerging leaders an educational experience focused on the infrastructure of Rockland County, New York – presented by leaders in government, business and non-profit sectors. The program, which consists of 11 daylong sessions over a 10-month period, engages and challenges its participants to examine issues and seek solutions. The Leadership Rockland program is a valued resource for and in our community. To identity, inform and inspire leaders to better serve our community by increasing their awareness of the many facets of Rockland County.